5 PLACES NOT TO BE MISSED IN BILBAO - Bilbao is refreshingly diverse! 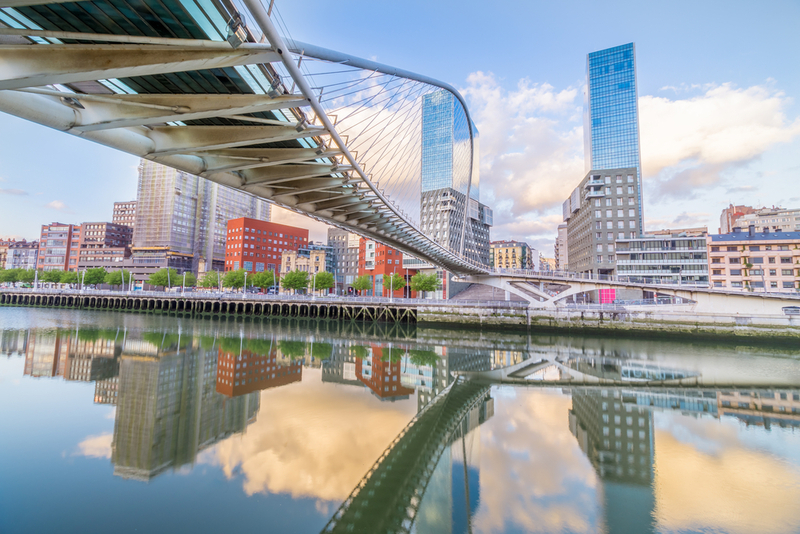 Fine arts, history and fresh sea air, Bilbao is refreshingly diverse! Anyone visiting Bilbao should head for the magnificent Guggenheim Museum, a spectacular architectural work of art that’s widely renowned as a ground-breaking example of 20th-century architecture. Designed by Frank Gehry and using advanced aerospace industry software it was built between 1993 and 1997. And what you see outside is just a teaser for what you’ll find inside as the museum boasts over 24,000 square metres of floor space showing works of art in wonderful surroundings. With the huge windows letting in natural light you will see the masterpieces at their very best in the Atrium. Also the Guggenheim has a rotating permanent collection and many temporary special exhibitions throughout the year. There is also a place to top up on those souvenirs at the museum shop or why not rest up with something tasty at the cafeteria. The Bilbao Museum of Fine Arts is an outstanding collection situated in two separate buildings and displays works by many of the famous European masters dating from the 14th to 17th centuries. Spanish paintings from the 14th and 15th centuries include works by Jaime Huguet, Bartolomé Bermejo, and Pedro Serra with even more from the 16th- to 17th-century Spanish with works by El Greco, Zurbaran, as well as paintings by Velázquez and Jusepe de Ribera. There is a whole floor dedicated to Basque artists which includes 22 pieces by Dario de Regoyos while the more modern building displays mostly works by contemporary Spanish artists. Look out for one of Bilbao’s Michelin-starred restaurants near the museum. Restaurant Zortziko (17 Calle Alameda Mazarredo) which serves wonderful haute cuisine and is well worth the walk! A must for anyone wanting to experience Bilbao as it was because the old town is just full of charm, and is a wonderful place for a stroll along the river or to stop and have a coffee as the world goes by. Linked by five bridges, the old town connects with the New Town (Ensanche) but the heart of the Casco Viejo is to be found on the Siete Calles (Seven Streets) where you’ll meander through quaint historic streets which are lined with terrific shops and cafés. the Doña Casilda Park is a very welcome respite from the hustle and bustle of the city and with plenty of clean green areas that are superbly landscaped in a ‘Romantic’ style the walks through the park, via the many pathways, is peaceful and relaxing, and there’s plenty of places for a sit down if you need a little rest! . Statues and fountains can be found all over the park and a wander down to the lake to feed the ducks is a great way to spend an afternoon, whether in the shade of the trees or taking in the sun on the lawns. Formerly used as the outbuildings for the Euskalduna shipyard, this unique museum shows visitors what it was really like to be at sea with an outdoor exhibition that takes in the docks as well as several restored ships. When you go inside the museum, there are plenty of exhibits to educate visitors (young and old) on the environment of the Bilbao Estuary and the history of the maritime industry. You can also learn about the traditions of the local people who have spent their life and earned their living from the estuary. Open daily except Mondays it’s a nice refreshing look back at history next to the sea.